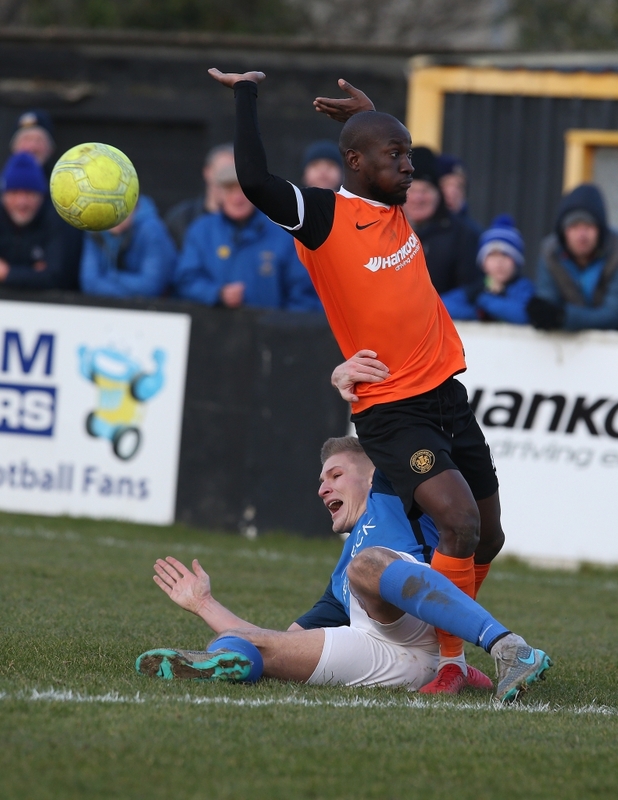 Glenavon continued their excellent away form by defeating Carrick Rangers 2 – 1 at the Belfast Loughshore Hotel Arena on Saturday despite going a goal behind and having to play much of the second half with 10 men. Darren Henderson gave Rangers the lead shortly after the break, but Rhys Marshall hit back for the Lurgan Blues minutes later. 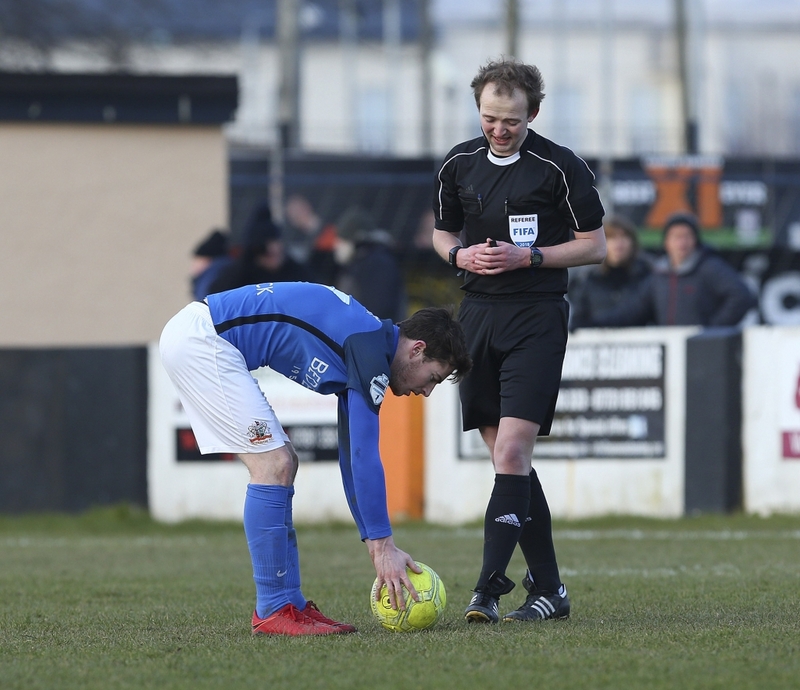 Glenavon winger Joel Cooper was controversially shown a second yellow card just before the hour mark for a challenge on Daniel Larmour. 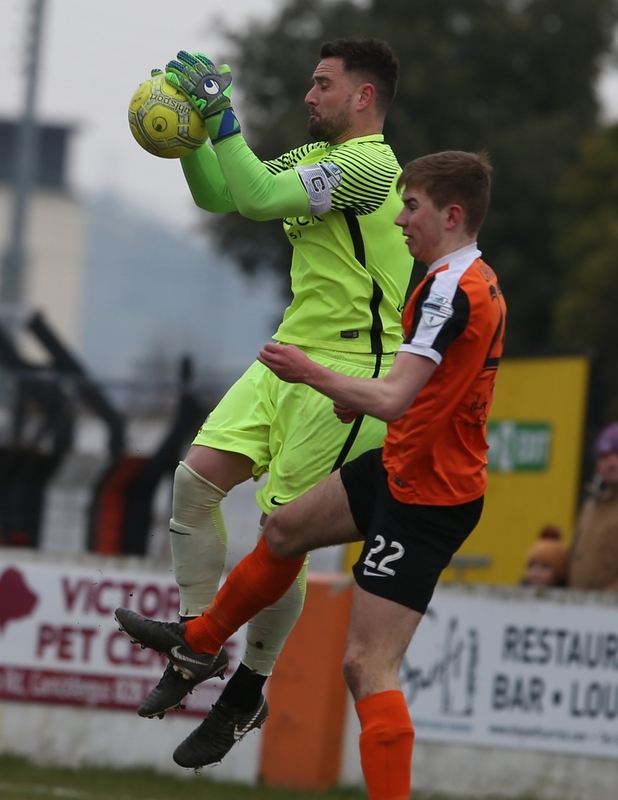 However, Andy McGrory converted a penalty in the 80th minute to seal the three points for the visitors, after Andrew Mitchell had been hauled down by Ralph Kottoy. 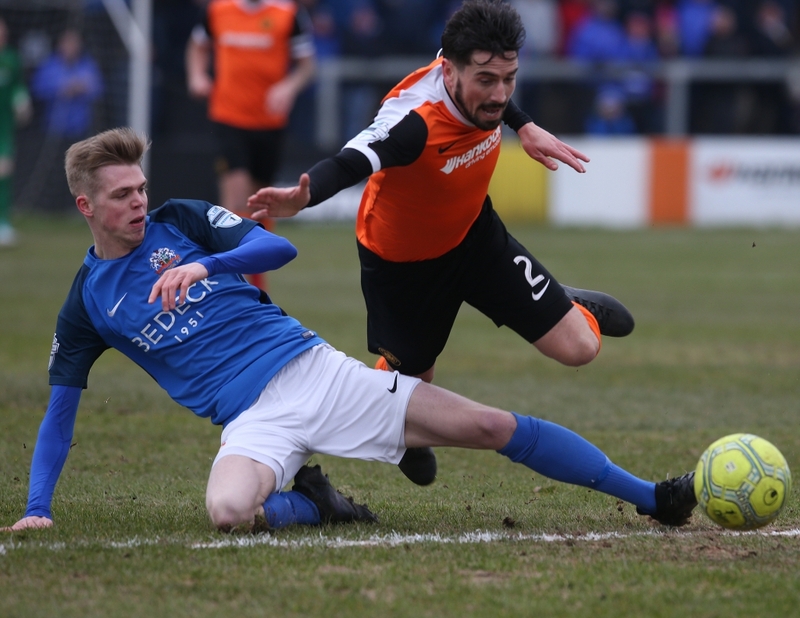 Glenavon midfielder Bobby Burns had the game’s first opportunity when he had an effort on goal from a free-kick some 20 yards out. 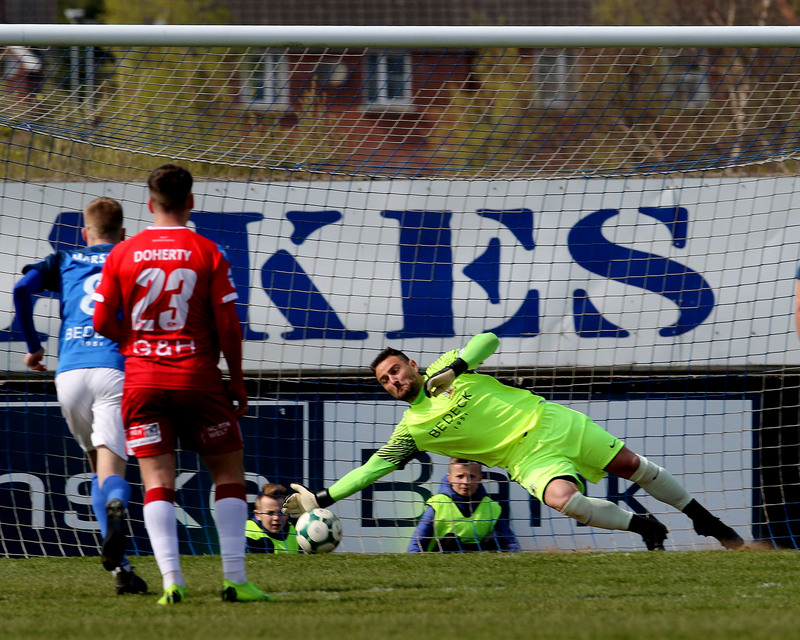 Burns’s left-footed shot was well struck but it went straight into the arms of Carrick goalkeeper Harry Doherty. Burns had another effort on goal in the 14th minute which went over the top, while Cooper’s shot five minutes later resulted in the same outcome. The best effort of the first half came from Stephen Murray. Andrew Hall whipped in a corner from the left which found Murray at the far post. The striker caught his volley sweetly with his left foot, but his shot flew across the face of goal and went narrowly wide of Doherty’s right-hand post. Eric Foley came on in the 31st minute to replace the injured Andrew Doyle. Glenavon shuffled their pack, with Marshall moving inside to centre-half, Burns dropping back to left-back and Foley slotting into the centre of midfield. 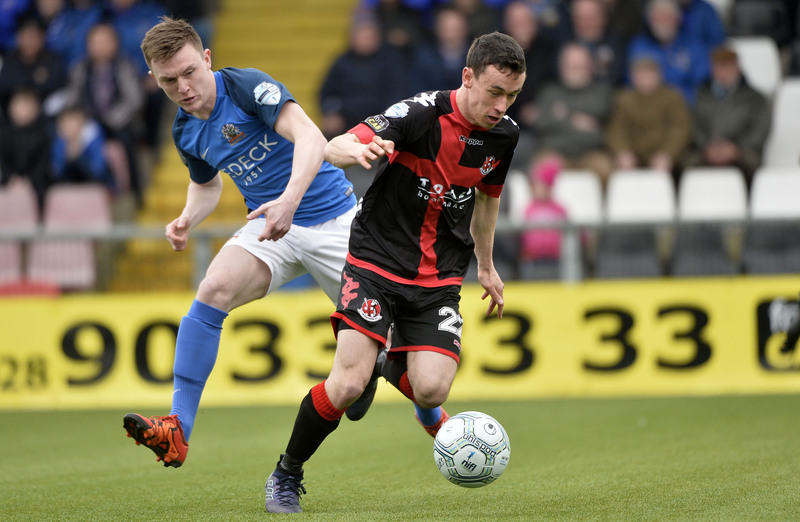 The former Glentoran man looked impressive, trying to put his foot on the ball and make things happen, but he will have been disappointed with his free-kick five minutes before the break which went harmlessly over the bar. 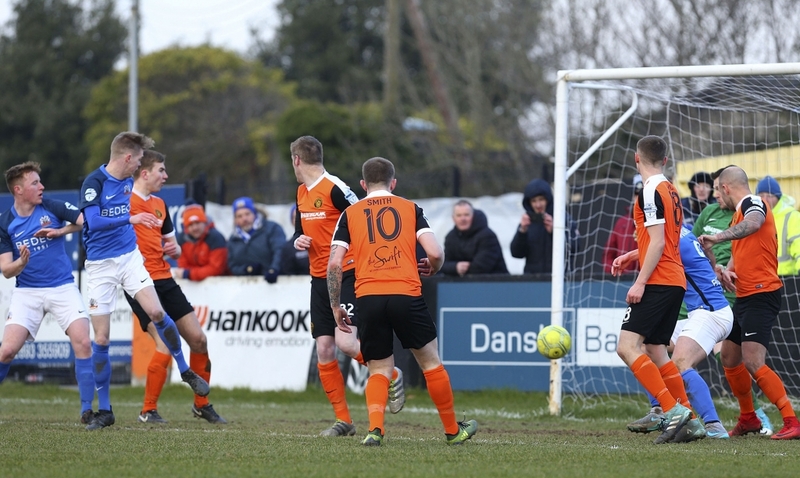 Carrick caught Glenavon cold in the second minute of the second half with some route-one football. Doherty’s long kick out of his hands went over the head of Caolan Marron and was allowed to bounce. Henderson latched onto the ball and slipped it beyond the onrushing Jonathan Tuffey. Marshall did his best to prevent it from getting over the line, scrambling back and sliding to try and hook it clear, but he couldn’t keep the ball out of the net, and the home side found themselves in front. However, Rangers’ advantage didn’t last long. In the 52nd minute Burns sent a corner over from the right and Marshall rose to meet it, heading the ball down and through the legs of Doherty to draw the Lurgan Blues level. 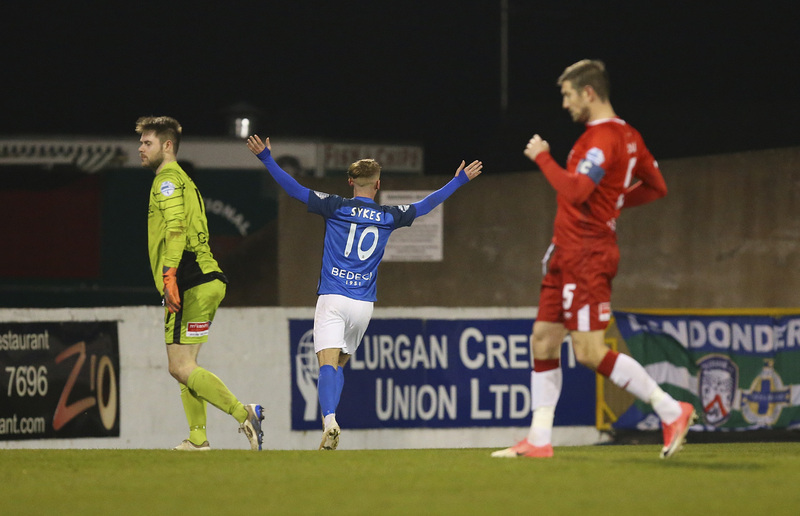 On 58 minutes Glenavon were reduced to 10 men in controversial circumstances. Cooper, who had been booked in the first half, made what looked like an innocuous challenge on Larmour, appearing to win the ball cleanly without even going to ground. The young Carrick defender made a meal of the tackle, and disbelief soon gave way to anger among the travelling fans when referee Keith Kennedy produced a second yellow card, followed by the inevitable red. 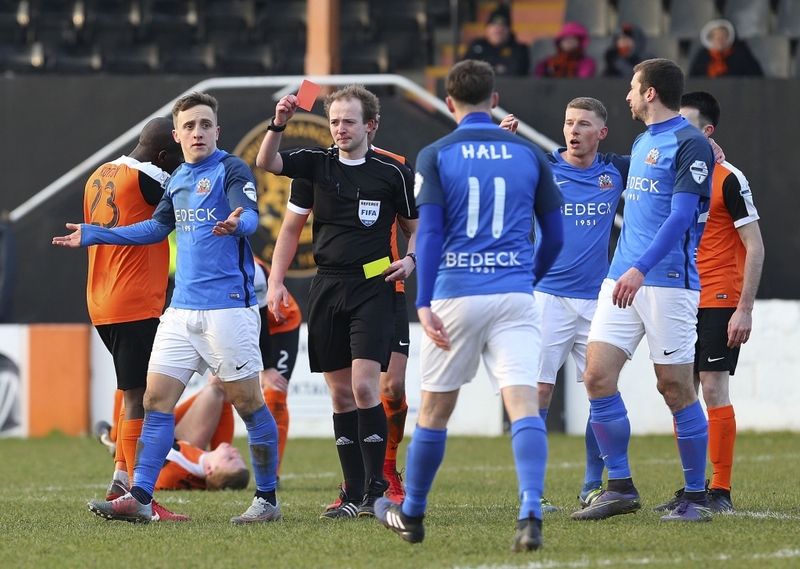 To Glenavon’s credit they did not let the incident distract them from the task at hand. Despite their numerical disadvantage it was clear that they remained determined to leave Taylors Avenue with all three points, and that’s exactly what they went on to do. Ten minutes from time Hall threw the ball in from the right sideline towards Mitchell who was standing just inside the penalty area. As the striker tried to turn he was challenged clumsily and upended by Kottoy. Kennedy pointed to the spot. 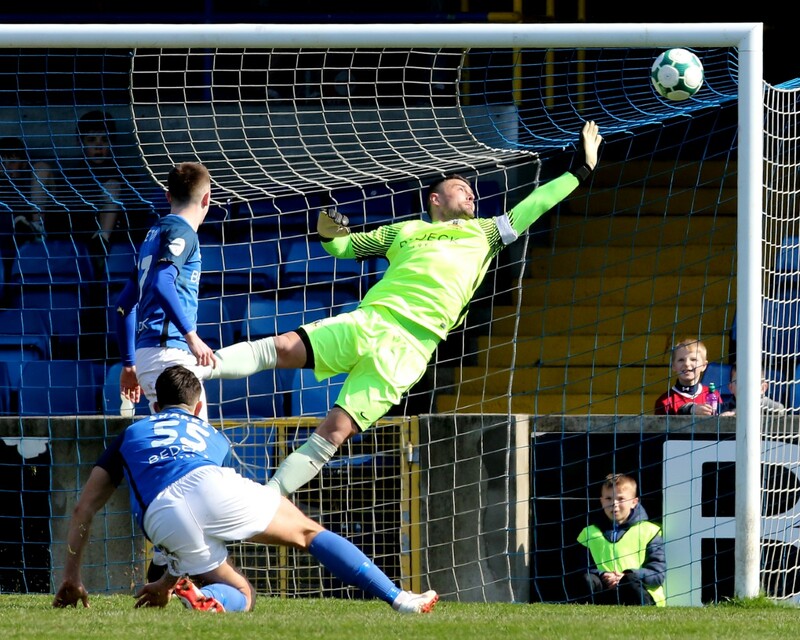 Sammy Clingan has been Glenavon’s regular penalty taker this season, but McGrory has proven himself to be equally as clinical from the penalty spot over the years, scoring some very important goals for the Lurgan Blues from 12 yards in recent seasons, and he stepped up to take the kick in Clingan’s absence. He made no mistake, striking the ball down the middle as Doherty dived to his left, to ensure that Glenavon went away as 2 – 1 winners. 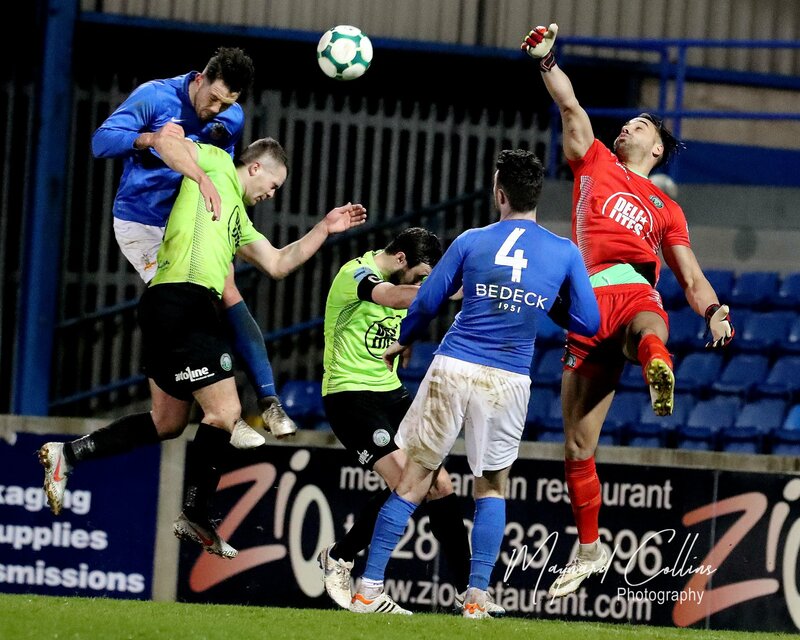 On Tuesday night (February 27th) Glenavon travel to Windsor Park to take on fourth-placed Linfield in a rearranged Danske Bank Premiership fixture (kick-off 7.45pm). With Glenavon just three points above Linfield in the table, that is set to be a massive game in the race for third place. Following that, next Saturday (March 3rd) the Lurgan Blues welcome Championship side Loughgall to Mourneview Park for the Tennent’s Irish Cup quarter-final tie.